Repeated from "We're on the Road to D'ohwhere"
"Rome-Old and Juli-Eh" is an episode of The Simpsons eighteenth season. It was written by Daniel Chun and directed by Nancy Kruse. It originally aired on March 11, 2007. Jane Kaczmarek reprises her role as Judge Constance Harm. 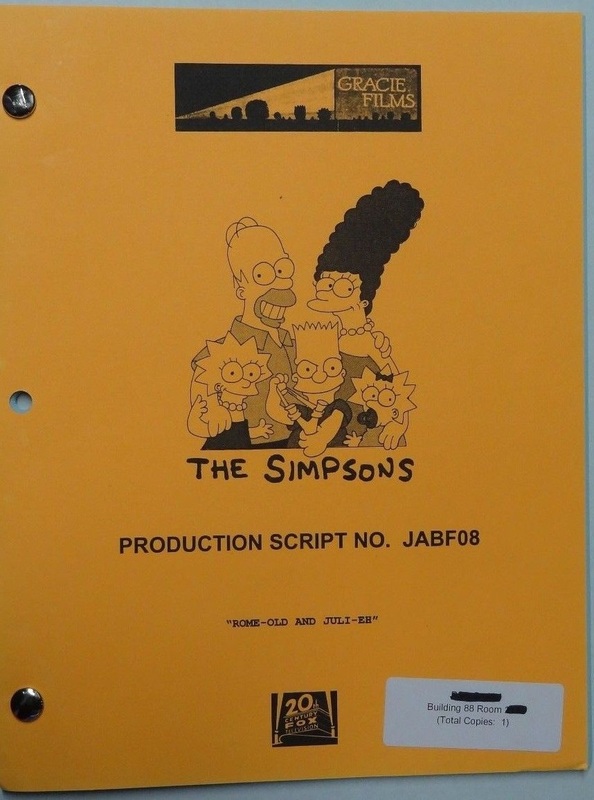 "The court appoints an accountant for Homer when he incorrectly files for bankruptcy, which results in his cutting back on all of his expenses, including Grampa's nursing home. In an unexpected turn of events, Grampa and Selma fall in love and move in together, and Homer and Patty plot to break up their love connection. Meanwhile, Bart and Lisa con a delivery man into giving them the most sought-after commodity in the neighborhood's cardboard boxes. Their alliance is put to the test when the delivery man realizes he was duped." Homer Simpson surprises the family with a newly decorated basement, now a rec room with a pinball machine, a ping-pong table and other luxury items, prompting his wife Marge to ask how Homer could afford all this. He says he has a plan and in the next scene files for bankruptcy before Judge Constance Harm, believing that this will save him from paying his debts. Unfortunately, Judge Harm tells him that the bankruptcy laws have changed and under the new laws, he has to pay everything back. When looking though the family's expenses, Homer decides to save a lot of money by moving his father Abraham out of the retirement home and having him live with the family. The rec room now doubles as Grampa's room. One night Homer and Marge go out, and they ask Abe to babysit. Not entirely trusting Abe's competence as a babysitter, Marge also asks her sister Selma Bouvier to come over and watch Abe watch the kids. 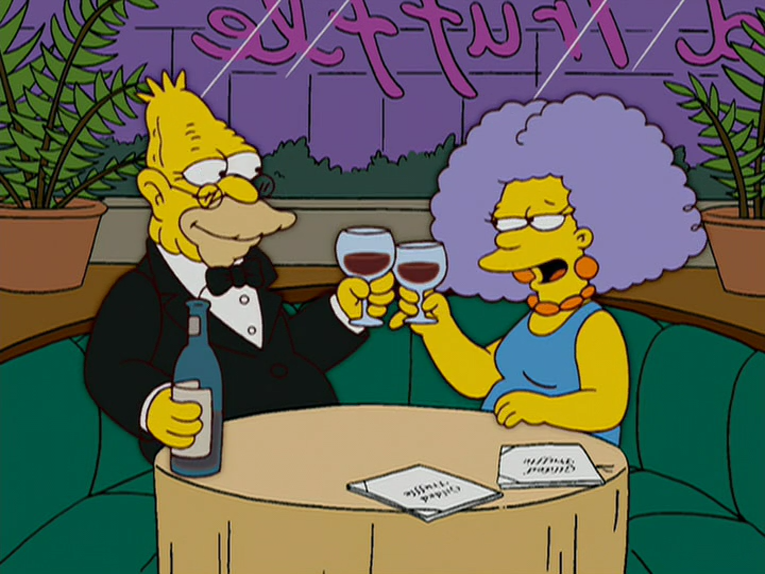 During the evening, Abe and Selma end up kissing and eventually fall in love with each other, and are unaware that they are caught by Homer, much to his dismay, as he wants his dad to end up old and lonely. Grandpa previously dated Selma's mother Jacqueline Bouvier in "Lady Bouvier's Lover". As is the case in this episode, Marge is happy with the arrangement while Homer is not. Homer calls Selma's twin Patty, and asks her how she feels about this pairing. Patty is no happier than him and she enlists his help to break them up. Patty impersonates Selma and Homer dresses up as "Esteban de la Sexface", a Spanish lover-type, and the two arrange for Abe to catch them kissing. Their plan is foiled though, when the actual Selma comes by and catches them. Angry at being manipulated, Abe proposes to Selma. She accepts; they are married and move in together. With Abe unable to find work, Selma is the sole breadwinner in the family, working hard in her new, more stressful job as department manager at the DMV. Abe, meanwhile, screws up their kitchen with his ignorance of how things work by putting pancake batter into a CD player, a blender cup on the stove, and a tape into the microwave. This causes the microwave to explode, the stove to catch on fire, and the radio to leave a burnt smell around the house. This makes Selma realize that maybe love is not everything you need after all, and she dances with him one last time. They presumably divorce with Abe moving back to the retirement home and Selma moving back to her and Patty's room at Spinster Arms Apartments. Bart and Lisa in their fort. Kicked out of the rec room, Bart and Lisa order a lot of complimentary shipping boxes from the A.S.S. (American Shipping Services), getting the idea from Ned Flanders, and build a fort out of them. When the Sarcastic Man (who is a delivery man in this episode) becomes angry and asks for them back, they refuse, whereupon he threatens to come back and get them by force. Bart and Lisa think he is bluffing, but in fact he comes back with an army of delivery men and women. 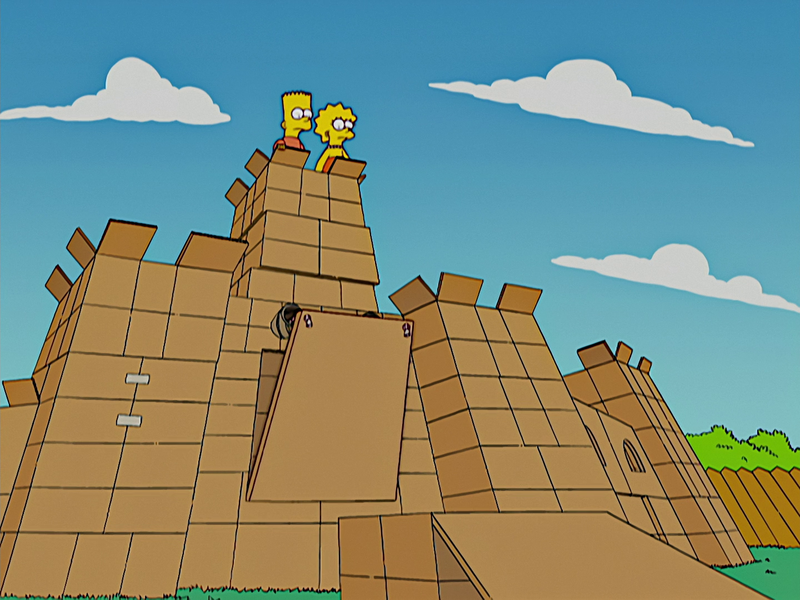 Bart and Lisa put up a brave fight, first by releasing a barrage of cardboard tubes to trip the enemies, then using cardboard squares to throw like shuriken. The delivery men and women set up a siege ladder and Lisa wraps the lead man in tape and pushes the ladder down. They are aided by Nelson, who arrives unexpectedly to aid Lisa, who could have been hit by a barrage of cardboard arrows. He dives down with twin cardboard tubes and fends off a large number of delivery men and women. The army swarms while Bart uses a cardboard tube to shoot down enemies with bricks, beehives, egg cartons and Snowball II. The A.S.S. legion fails and flees, but the kids immediately lose interest in their fort and melt it with the garden hose. Modified on July 1, 2018, at 18:44.